After any sort of dangerous collision, safety must come first and foremost. Before you start trying to collect information, ensure everyone is in good condition and react appropriately. If you are physically able, try and follow the remaining tips. Many truck accidents can be laid directly at the feet of the trucker’s own negligence, rather than the smaller vehicles they often collide with. Do not say you are to blame, and do not even apologize, as this will shift liability back towards you. Information used to identify a truck and its driver may be wholly dissimilar from the information you gather after a car accident. Be sure to get all the data and documentation you can, including the often-forgotten trailer number (usually six digits on the side or back of the trailer). There should be a number on the tractor door or fender which you should get as well. If you have a camera, take pictures of everything. Was your truck accident something that involved multiple cars in a chaotic pileup? If so, you will want to get information from everyone. Each person could be a key to you receiving a fair settlement. 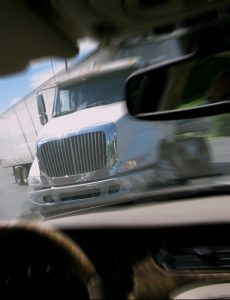 It seems obvious, but take detailed notes about the location of your truck accident. If the area is prone to collisions, or if the same trucking company has had a crash there before, it could be beneficial to your case. As with “where,” “when” your truck accident occurred is more important than you might realize. If it happened late at night or early in the morning, it could be a huge indicator that truck driver fatigue was at play. Sometimes a truck accident is not exactly the fault of the trucker, but rather a maintenance issue is the primary source. Perhaps even their parent company told them to disobey speed limits to make a delivery on time. Before you file a lawsuit, let a professional personal injury attorney examine your case. In case you didn’t see a doctor immediately after the accident, you really should visit one as soon as you can. Just a slight soreness could indicate an underlying health issue, especially for pain in your neck or back. Plus, a doctor’s statement is a powerful piece of evidence for your claims. Speaking of which, an insurance company might come out of the blue to offer you a settlement. Do not accept it without consulting with your lawyer first. Otherwise, you could be taking only a fraction of what they ultimately could owe you for their negligence. So who can support you during this time? The Fort Worth truck accident attorneys from Parker Law Firm can! Since 1985, Brad Parker has been standing up for the rights of ordinary people caught in unfortunate situations that were outside of their control. To discover all we can do for you and just how seriously we can take your case, call (817) 503-9200 today for a Complimentary Strategy Session!